Ananka's Diary: Today's Installment of WHAT IS IT? You were pretty close, I think it's a horseshoe shrimp. Although, they're crustaceans instead of chelicerata, so really not that closely related. Wow, you take the prize once more! Are you a professional detective/zoologist? My only question . 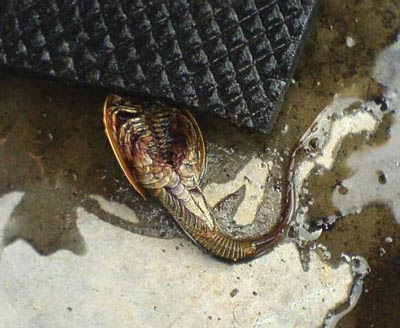 . . how did a horseshoe shrimp get into a trench in Russia? Hey, they look a lot like triops! Now those are just Wierd! Even by MY standards! That does look horseshoe crabish. I will not forgive you for posting that next to the ice cream. I'm here late...but, that does not look like a Triop or Horseshoe Shrimp because the design is different and you can't really see the eyeballs. Secondly, why would the people be so amazed if this was a thing is known by so many? It DOES look like one of those triops or sea monkeys. 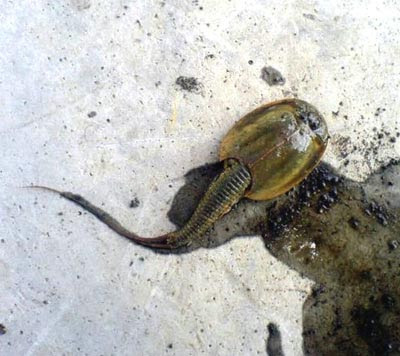 I used to have triops...when some of them died I had to fish them out quick...they're cannibals. Then they sat in a box in the freezer waiting to be buried... then my mother put her foot down. It was a very...weird funeral. That would actually make a great story, Hazel. You should write it down! Ugh. It looks like that thing they put in Chekhov's ear in that one "Star Trek" movie. Bleurgh. Chris: You're so right! I was freaked out by that thing for years. Chris, its so cool that a guy (maybe) is on this blog we need more guys! !